The mission of RYA is to provide an opportunity for children of Reston and the surrounding areas to participate in an organized youth football and cheerleading programs. We aspire to build a successful youth organization by applying standards and activities that will create an environment of athletic enthusiasm and learning with a focus on achieving high academic standards. RYA’s board strongly believes it is our responsibility to be positive role models by giving back to our youth and continually striving to build a healthy positive community. **Want to know what the board is up to? Would you like to learn about your voter rights as a member of RYA? Board meetings are the 2nd Tuesday of every month and is open to all members. Email for specifics. As we finish the school year and move into the summer, we wanted to remind parents that each player must have an active Walker ID card to play tackle football in the Fall. 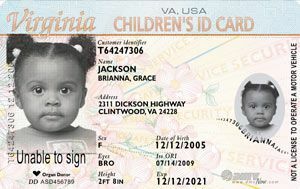 All players must have a valid Walker ID card issued by the Virginia Department of Motor Vehicles. The ID cards are used to verify each player at the official Fairfax County Youth Football League weigh-in certifications that will take place in August. Receipts from the VA DMV will not be accepted. These identification cards are no longer issued by the DMV in person. It will be mailed to your home within 7-14 business days. So the earlier you can get this done the better. Please ensure your child’s name, address and date of birth are 100% accurate on the ID. If you already have a Walker Permit please check the expiration date. If it has expired you will need to renew it. The cost of the permit is $10.00.